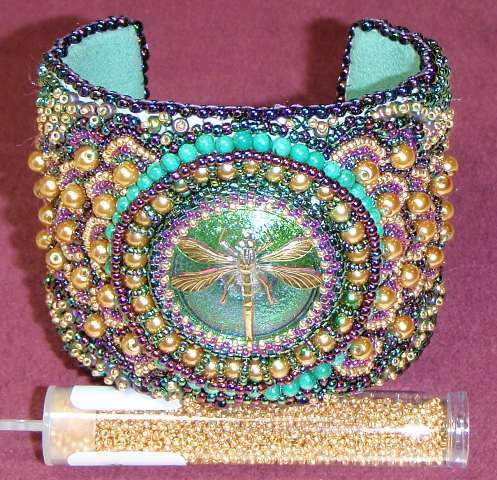 I decided to join in the Beading Babes Project 6 beadalong which offered several enticing projects. Because the initial reveal date was beginning of September, I thought I'd best not bite off more than I could chew and opted to do just one of the projects, Ripple Cuff by Sherry Serafini from the June/July 2011 issue of beadwork . I enjoy bead embroidery but my approach to design is pretty random so the idea of following a pattern for an embroidered piece was intriguing. As a centre focal I selected this green/fuchsia Czech glass dragonfly button, which I backfilled with interfacing donut shapes to accommodate the shank. I chose green iris, fuchsia, gold metallic and purple iris size 15s to match. Having attached it to the foundation and worked the bezel in delicas and size 15 beads, I already decided to deviate from the pattern by using a cuff blank instead of a clasp. The button was 31mm diameter and it was obvious that I'd have more rows of 'ripples' to do to cover the area of a 5cm cuff blank. I then discovered that I really don't like doing repetitive fills in bead embroidery, and that it is hard to get them to be nice and round. Perseverance is my middle name (not really!) so I completed the three rows of the original pattern and extended them up round the edge of the centrepiece. At that point I decided enough of a good thing is a feast! I went into a 'fill the space any which way' mode and found some higher metallic Toho size 11s to round off the ends. Due to the rather large finished size I decided to forgo the drop edging in favour of purple iris size 8s brickstitched to the covered form, I also had to add a further row of charlottes to the bezel as the focal wanted to pop out. 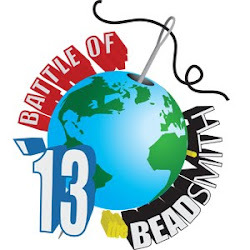 I'd just like to encourage you all to take a look at the other Beading Babes Blogs, find your way to the facebook group if you'd like to join the next projects, and if you visit Karyn Healy-White's blog (Releases by Rufydoof) you will find more info! I'm with Nancy, I love your interpretation of the design. And that's what I really like about Beading Babes. Getting to see what everyone else does with a pattern, and how you can take a pattern 'outside the box'. And of course, I love the button!! I love this! The button is gorgeous and I love how you filled in with the seed beads. The bracelet is stunning and I love that you used the blank. It's perfect. Oh gosh, gorgeous result! Those of you that used buttons had a great idea; I've also seen a technique that has you make a small hole thru the foundation to accommodate the shank, but that probably wouldn't have worked well with your blank. I think your freeform work is just gorgeous and is very effective in balancing the design. I love your rendition of the Ripple Effect it is gorgeous. 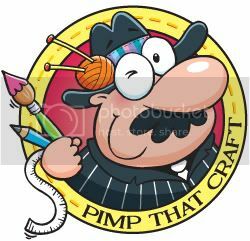 I have this button and it does have a very pretty fuchsia color to it. I used a Czech button as the focal in mine as well, but I cut the shank off and filed it down smooth. I did not think to use something to fill in the space. Thank you all, it is really interesting to see the variations, and colours chosen for the same project. I hope to join in Project 7 too if time allows. I have a good number of Czech buttons and now I'm not so afraid to use them, so I expect a few more pieces will be born!